At The Honolulu Key Guy: Locksmith & Key Maker, we are dedicated to the science of making keys and the art of defeating locks--with a smile. The Aloha Spirit runs deep in our locally owned and locally operated business. The owners founded The Honolulu Key Guy: Locksmith & Key Makeras a fountain of Honesty and Aloha in Hawaii. They charge bargain rates compared to the mainland-based locksmith companies, because we don't report to a receptionist wired to a call center, nor do we waste money on hefty advertising fees. When you call us, you will always speak to a locksmith familiar with Hawaii street names and every neighborhood on Oahu. Your locksmith will advise you about your problems, and already know how to fix it when he arrives. 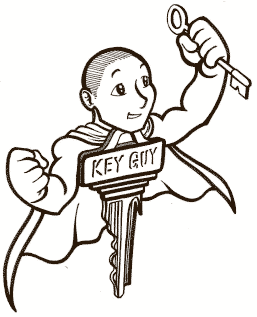 Because The Honolulu Key Guy: Locksmith & Key Makeris a local, family-owned company, we can guarantee prices you can afford. You may have noticed that we hardly advertise, and that is because we guarantee fair prices and honest locksmithing: The Honolulu Key Guy: Locksmith & Key Maker's operations hinge on customer loyalty and 100% customer satisfaction. Our biggest source of jobs is word of mouth and repeat business. Our goal is to make you happy!